Tree transplanting is the moving or relocation of trees. This can be done for several reasons, such as landscaping, site constraints or to preserve trees that would otherwise be removed. Our award winning tree transplanting division, The Tree Movers, is the leader in tree transplanting in Australia and overseas. The Tree Movers' reputation in tree transplanting in Sydney and beyond has taken us to 7 countries in 3 different continents. We have been involved with more than 45,000 transplants worldwide, each varying between several hundred kilograms to several hundred tonnes in weight. Some of our past projects include Stadium Australia, San Diego Zoo; Disney Land - Hong Kong; Wynne Resorts, Las Vegas. If you wish, for a small fee, one of our transplant consultants can assess the tree(s), determine if the transplant is viable, and provide you advice on the best way to proceed. What is a tree spade? A tree spade is an ingenious machine used in providing tree transplanting services for palms and smaller trees. .
Our largest tree spade, the 2100, is mounted on a 240hp turbo charged bogie drive truck. The weight of the machine and the truck is about 15.5 tonnes. The front bumper alone weighs nearly 1000kg. At the upper limit, our biggest tree spade can carry a palm or tree weighing up to 12.5 tonnes. Hydraulic tree spades were originally designed by Texan, Al Korenek. The 2100 was manufactured in, and imported from the USA. There are six hardened steel spades in all. Three spades are fixed and the remaining three form two hinged gates, one of two blades and one of one blade. These are opened, and the truck reversed up to the tree. The gates are then closed around the tree, hydraulically locked. The blades are then pushed into the soil. When all six blades are fully inserted, the tree is then lifted out of the ground, and laid down, ready for travel. A bank balance of around three quarters of a million dollars will see you into your own tree transplanting machine. A replacement blade is worth about $5,000 whilst a service on the truck and machine costs about the same. What size can it move? There is nothing like finding new limits. 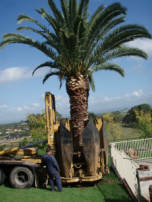 It has been successfully used to move a 18m high palm tree. It has been used to move trees with trunks up to 45cm in diameter. Nearly all palms and trees with trunk diameters of 15-20 cm are generally ideal. Most palms and more than 90% of trees can be successfully transplanted, including wattles, gums and many Australian natives not previously movable. Why use a tree spade? A tree spade is only one method of tree transplanting. It has several advantages. The system is complete. It digs the hole, digs the tree, transports the tree and plants the tree. The spade gently lifts from the underside causing little damage to the tree other than cutting the roots. Where suitable access is available, it is often the cheapest and the best way of moving trees in the right size range.